After a recent power outage that left the San Pedro Police Department without electricity for over 24 hours, Aquafino and Sandy Point Real Estate decided to donate a large generator. Funded through Aquafino’s Costa Maya Fashion Show early in August, the machine was handed over to Deputy Executive Office for the Coastal Zone and Assistant Superintendent Henry Jemmott on Friday, October 21st. 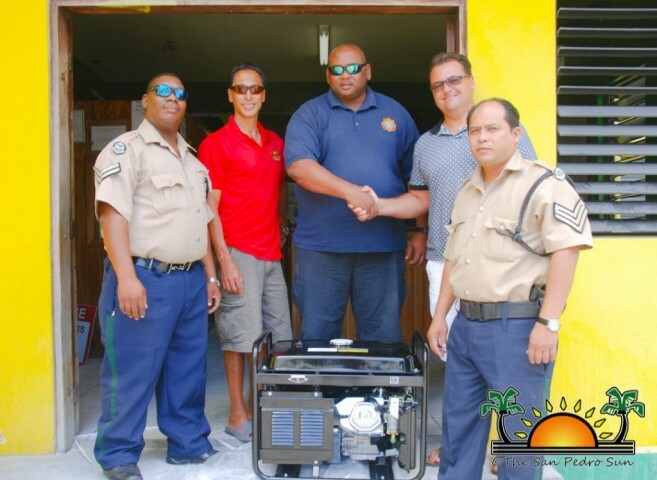 President of Acquafino, William Narod, was more than pleased to able to donate this generator. “When we heard that the police department needed this equipment to do a better job, and to take care of the island, we put them on our priority list. So in whatever way we could have helped, I and Daniel Hartin from Sandy Point Real Estate were happy to do so,” said Narod. At the handing over, Jemmott stated his appreciation. “The police has been requesting a generator for a long time…almost two years. I’m happy that Aquafino and Sandy Points donated this valuable generator to the police. It is well-needed, especially in times of emergency. Since we are experiencing hurricane season, we need to be fully equipped to ensure that if electricity goes off, it won’t interfere with our duties,” said Jemmott. He furthered stated the challenges the police station faces when power is cut off, and the dangers of not being able to monitor detainees in the holding cell. Jemmott is more than appreciative to both donors for the much-needed contribution. He also gives a special thanks to the business community, who always adheres to the needs of the department. The SPPD is currently partnering with the Social Security Board to get an additional generator. According to Jemmott, the next plan for the police is to build a generator room, and hire an electrician to install the newly-donated equipment.